هدف اصلی در این پژوهش ارائه مدل شبیه‌سازی پویای نرخ بیکاری در ایران با استفاده از عوامل تقاضای کل و مقایسه آن با آمار ارائه شده از سوی بانک مرکزی است. نرخ بیکاری در دوره 1355-1392 با استفاده از روش شبیه‌سازی گذشته‌نگر و روش حداقل مربعات پویا شبیه‌سازی می‌گردد. برای این منظور، در ابتدا با شناسایی متغیرهای تأثیرگذار بر تقاضای کل، معادلات بخش‌های مصرفی، عمومی، خصوصی و خارجی فرمول‌بندی می‌گردد. سپس با استفاده از سیستم معادلات همزمان و سناریوسازی، نرخ بیکاری به صورت پویا به بخش تقاضای کل مرتبط می‌شود. یکی از موفقیت‌های به دست آمده در پروسه شبیه‌سازی، معنی‌داری بالای معادلات برآورد شده است. نتایج شبیه‌سازی نشان می‌دهد که نرخ بیکاری از مقدار 1/16 درصد در سال 1385 به میزان 9/15 درصد در سال 1388 رسیده و سپس به میزان 5/25 درصد درسال 1392 افزایش پیدا کرده است. The main objective of this study is to provide a dynamic simulation model of unemployment rate in Iran by using aggregate demand and comparison with the statistics provided by the central bank. The unemployment rates in the period 1976 - 2013 using ex-post simulation and dynamic least squares simulation methods, simulation were done. To this end, at first, by identifying the variables affecting on aggregate demand, equations for consumption, public, private and foreign functions are formulated. Next, using a simultaneous equations system and scenario making, the unemployment rate is dynamically linked to the aggregate demand. One of the successes obtained in the simulation process is high significance of the estimated equations. Simulation results show that the unemployment rate declined from 16.1 percent in 2006 to 15.9 percent in 2009 and then increased to 25.5 percent in 2013. ابریشمی، حمید؛ «تابع تقاضای صادرات ایران با رویکردی نوین»، پژوهش‌نامه بازرگانی، 1380، شماره 18. بانک مرکزی ایران؛ اداره حساب‌های ملی (1338-1388)، حساب‌های ملی ایران، تهران، بانک مرکزی ایران. بانک مرکزی ایران؛ شاخص بهای کالاها و خدمات مصرفی در ایران (1368-1388)، بانک مرکزی ایران. برانسون، ویلیام اچ؛ نظریه ‌و سیاست‌های اقتصاد کلان، ترجمة عباس شاکری، تهران، نشر نی، 1376. بلالی، حمید و صادق حمیدیان؛ «تأثیر سرمایه‌گذاری بر اشتغال‌زایی و تقاضای نیروی کار در بخش کشاورزی ایران»، فصلنامه اقتصاد کشاورزی و توسعه، سال یازدهم، 1382، شماره 41 و 42. بید آباد، بیژن و کامبیز پیکارجو؛ «شبیه‌سازی و پیش‌بینی قیمت نفت خام»، فصلنامه پژوهش‌نامه بازرگانی، 1386، شماره 7. بید آباد، بیژن؛ «اقتصاد قیمت سیمان»، شرکت سهامی عام سیمان فارس و خوزستان، تهران، دفتر برنامه‌ریزی و تحقیقات سیمان، دانشگاه صنعتی امیرکبیر، 1383. _______ ؛ «آثار الحاق ایران به سازمان تجارت جهانی بر صنعت سیمان»، شرکت سیمان فارس و خوزستان، تهران، دفتر برنامه‌ریزی و تحقیقات سیمان، دانشگاه صنعتی امیرکبیر، 1383. تقوی، مهدی و سینا نعمتی‌زاده؛ «بررسی اثر متغیرهای کلان اقتصادی بر صادرات غیر‌نفتی»، پژوهش‌نامه اقتصادی، 1383، شماره 14. جلایی، عبدالمجید و مهدی شیر‌افکن؛ (1388)، «تأثیر سیاست‌های پولی بر سطح بیکاری از طریق تحلیل منحنی فیلیپس نیو کینزین در ایران»، پژوهش‌نامة علوم اقتصادی، سال نهم، 1388، شماره 35. خلیلی عراقی، منصور و علی سوری؛ «اشتغال در بخش‌های تولیدی و نقش عوامل طرف تقاضا»، نشریه تحقیقات اقتصادی دانشگاه تهران، 1383، شماره 68. کمیجانی، اکبر و صادق قویدل؛ «اثر سرریز سرمایه‌گذاری مستقیم خارجی در اشتغال ماهر و غیر‌ماهر بخش خدمات ایران»، مجله تحقیقات اقتصادی، 1385، شماره 76. رحمان، آرش و سعید ستایشی؛ «نقش توزیع ثروت، وراثت و کنترل جمعیت در رفاه اجتماعی: شبیه‌سازی رفاه اجتماعی در جامعه مصنوعی»، فصلنامه رفاه اجتماعی، سال هفتم، 1387، شماره 21. رضوی، مهدی و رسام مشرفی؛ «تحلیل دینامیکی اشتغال ایران (مطالعه موردی قانون اوکان)»، فصلنامه پژوهش‌های اقتصادی ایران، 1383، شماره 18. ریچارد جولی و همکاران؛ اشتغال در جهان سوم: مسائل و استراتژی، مقالات منتخب، مترجم احمد خزایی، تهران، سازمان برنامه و بودجه، مرکز مدارک اقتصادی، 1368. زراء نژاد، منصور؛ «تخمین تابع مصرف کالاهای مصرفی برای دو گروه خانوارهای شهری و روستایی ایران در دوره 1353-1377»، فصلنامه پژوهش‌های اقتصادی ایران، 1382، شماره 16. ________ ؛ «مدل تصحیح خطا برای مصرف خصوصی در ایران»، مجله دانش و توسعه، 1385، شماره 19. سازمان برنامه و بودجه؛ مستندات برنامه سوم توسعه اقتصادی، اجتماعی و فرهنگی جمهوری اسلامی ایران 1383-1379، جلد پنجم، تهران، مرکز مدارک اقتصادی - اجتماعی. سلامی، امیر بهداد؛ «مروری بر روش شبیه‌سازی مونت‌کارلو»، پژوهش‌نامه اقتصادی، 1382، شماره 3. فرج وند، اسفندیار؛ فراگرد تنظیم تا کنترل بودجه، تهران، انتشارات فروزش، 1389. متوسلی، محمود و معصومه فولادی؛ (1385)، «بررسی آثار افزایش قیمت جهانی نفت بر تولید ناخالص داخلی و اشتغال در ایران با استفاده از یک مدل تعادل عمومی محاسبه‌ای»، مجله تحقیقات اقتصادی، 1385، شماره 76. مرکز آمار ایران؛ سالنامه آماری کشور (1361-1387). منجذب، محمدرضا؛ «انتخاب مدل بهینة مصرف در ایران با اتکا به روش‌های اقتصاد‌سنجی»، مجلة برنامه و بودجه، 1375، شماره 8. 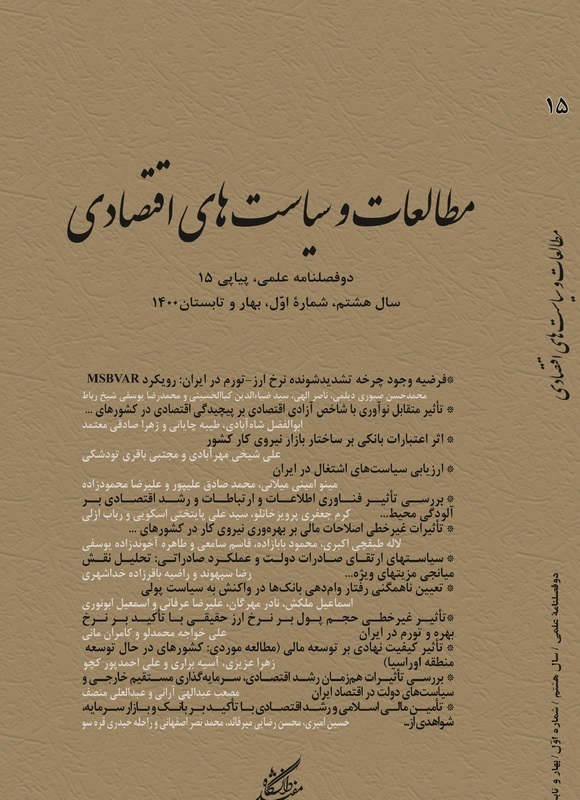 مهرآرا، محسن؛ «پیش‌بینی تقاضای سیمان طی دوره 1382-1390»، فصلنامه پژوهش‌نامه بازرگانی، 1385، شماره 38. ولدخانی‏‏‏‏، عباس؛ «برآورد و تحلیل تابع مصرف بخش خصوصی در اقتصاد ایران (1338-1374) با استفاده از روش همگرایی»، نشریه مجله برنامه و بودجه، 1376، شماره 16 و 17. H. Ahumada and Y. Garegnani; 2003, "Wealth Effects in the Consumption Function of an Emerging Economy Argentina, 1980-2000", http://www.aaep.org.ar/anales/works/works2002/ahumada_garegnani.pdf. Abrams, B. A; 1999, "The Effect of Government Size on The Unemployment Rate", Public choice, Vol. 99, No. 3-4, pp. 395-401. Akhand Akhtar, Hossain; 2008, "Structural change in the export demand function for Indonesia: Estimate, analysis and policy implications", Journal of Policy, Modeling 31, (2009), pp. 260-271. Alpizar, F., F. Carlsson, And O.J. Stenman; 2004, "How Much Do We Care About Absolute versus Relative Income and Consumption? ", Department of Economics, Gothenburg University, Sweden. Avazalipour, M.S; 2006, "Consumption Function in India and Iran", A comparative study, University of Pune, India. Barro, R.J and J.W.Lee; 1993, Losers and Winners in Economic Growth, Proceedings of the World Bank, Annual Conference on Development Economics, edited by M.Bruno and B. Pleskovic, pp. 267-97. Ben-David, D; 1998, "Convergence Clubs and Subsistence Economies", Journal of Development Economics, No. 55, pp. 155-171. Brown, R.L., J. Durbin, and J.M. Evans; 1975, "Techniques for Testing the Constancy of Regression Relationships over Time", Journal of the Royal Statistical Society- B, No. 37, pp. 149-163. Chakrabarty, M., and A. Schmalenbach; 2002, "The Effect of Current Income on Aggregate Consumption", University of Bonn, Lennéstrm the Economic and Social Review, Vol. 33, No. 3, pp. 297-313. Chari, V.V, P.J. kehoe and E.R.Mc Grattan; 1997, "The Poverty of Nations: A Quantitative Investigation", Research Department Staff Report 204, Federal Reserve Bank of Minneapolis, Minneapolis. Collier, P. and J.W. Gunning; 1999, "Explaining African Economic Performance", Journal of Economic Literature, No. 37, March, pp. 64-111. Diz. A.C; 1970, "Money and Prices in Argentina 1935-1962", in Meiselman D, ed; Varieties of Monetary Experience, University of Chicago Press, Chicago. Duesenberry, J.S; 1948, "Income - Consumption Relations and Their Implications", W.W.Norton Company, New York. Easterly, William, Michael Kremer, Lant Pritchett and Lawewnce H. Summers; 1993, "Good Policy or Good Luck? Country Growth Performance and Temporary Shocks", Journal of Monetary Economics, Vol. 32, No. 3, pp. 459-83. Evensky; 2001, "Heading for disaster", Financial Advisor, April, pp. 64-69. Feldman, Horst; 2006, "Government Size and Unemployment: Evidence from Industrial Countries", Public Choice (2006), Vol. 127, pp. 451-467. Fisher, Stanley; 1977, "Long-Term Contracts, Rational Expectations, and the Optimal Money Supply", Journal of Political Economy, Vol. 85, No.1, pp. 191-205. Friedman, M; 1957, A Theory of the Consumption Function, Princeton University Press. Hall, R.E; 1978, "Stochastic Implications of the Life-Cycle-Permanent Income Hypothesis: Theory and Evidence", Journal of Political Economy, Vol. 86, No. 6, pp. 971-987. Hernandez-Cata , E; 2000, "Raising Growth and Investment in Sub-Saharan Africa: What Can be Done? ", Policy Discussion Paper: PDP/60/4, International Monetary Fund, Washington D.C.
I.Palley, T; 2009, "Relative Permanent Income and Consumption: A Synthesis of Keynes, Duisenberg, Friedman, and Modigliani and Bromberg", Washington. IMF; 2008, World Economic Outlook, International Monetary Fund, New York. Karras, Georgios; 1996, "The Optimal Government Size: Further International Evidence on the Productivity of Government Services", Economic Inquiry XXXIV, pp. 193-203. Keynes, J.M; 1936, "the General Theory of Employment, Interest, and Money", Macmillan University, London, p. 96. Khan, M.S. and C.M. Reinhart; 1990, "Private investment and Economic Growth in Developing Countries", World Development Vol. 18, No. 1, pp. 19-27. Kuhn, W.E; 1970, The Evolution of Economic Though, Chicago: South Western Publishing Company. Lettua, M., and S. Ludvigson; 2001, "Consumption, Aggregate Wealth, and Expected Stock Returns", The Journal of Finance, Vol. LVI, No. 3, pp. 15-849. Ludvigson, S., and C. Steindel; 1999, "How important is the stock market effect on consumption", FRBNY Economic Policy Review, No. 2, pp. 29-51. Nawrocki. D; 2001, "Finance and Mount-Carlo Simulation", Journal and Financial Planning, Nonember, pp. 1-11. Ndikumana, L; 2000, "Financial Determinants of Domestic Investment in Sub-Saharan Africa", World Development, Vol. 28, No. 2, pp. 381-400. Nurkse, R; 1953, Problems of Capital Formation in Under Developed Countries, New York, Oxford University Press. Pindyck, S. P. and D. L. Rubinfeld; 1998, "Econometric Models and Economic Forecasts", McGraw-Hill. Ram, R; 1986, "Government size and Economic Growth: A new Framework and some Evidence from Cross- section and Time Series Data", American Economic Review, Vol. 7, No. 191-203. Ricardo M. Sousa; 2010, "Wealth Effects on Consumption: Evidence from the Euro Area", Banks and Bank Systems, Vol. 5, Issue 2, pp. 70-77. Seddeghi, H.R., K.A. Lawler, and A.V. Katos; 2000, Econometrics: A Practical Approach, Sunderland University, U.K.
Senhadji, Abdelhak S. and Montenegro Claudio E; 1998, "Time Series Analysis of Export Demand Equation: A Cross-Country Analysis", IMF Staff Papers, No. 98/149, pp. 236-268. Yuan, M., And Li, W; 2000, "dynamic Employment and Hours Effects of Government Spending Shocks", Journal of Economic Dynamics and Control, Vol. 24, No. 8, pp. 1233-1263.